You are here: Home / News / Happy Thanksgiving! The BlueSheepDog Crew wish all of our readers and supporters a Happy Thanksgiving! Fall is my favorite time of the year. Between cooler temperatures, beautifully colored landscapes, College football, and hunting, the fall season is packed with many of our greatest treasures. In addition, the Thanksgiving holiday sees some of the biggest sales all year, as we enter into the Christmas shopping season. This is particularly good for police officers as firearms, ammunition, and assorted gear go on sale. Many officers are not blessed with departments big enough to supply all of their duty gear, and this time of year is one of the few times officers can stock up on critical needs. 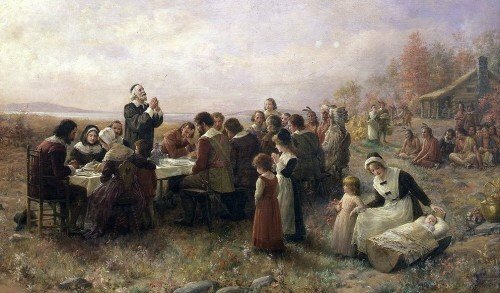 Pilgrims celebrating the first Thanksgiving in 1621 (painting by Jennie Augusta Brownscombe, 1914). It is said that Thanksgiving in America traces its roots all the way back to the Pilgrims, some of the first English settlers in the New World of America. There have been celebrations of Thanksgiving across many cultures, continents, and countries. However, the holiday of Thanksgiving may be most profound right here in the United States of America. In 1620, a group of religiously persecuted Pilgrims were able to hire the ship Mayflower to travel to the New World in hopes of a place to worship freely. Upon arrival they found a land rich in natural resources, but also harsh in weather and Native Americans. Thankfully, the local Wampanoag Indian tribe were peaceful and willing to help the fledgling colonists. In fact, the first winter in Massachusetts was so bad that the colonists retreated to the Mayflower to weather it out. Several colonists and sailors died from exposure and infectious diseases. When the spring arrived in 1621 the Wampanoag Indians arrived to welcome the settlers. Among the tribe, was a Patuxet Indian named Squanto, who happened to know English. Come to find out, Squato had been captured by previous exploring English sailors and taken to England. He landed in London, and learned English, ultimately finding another exploring ship to join and return to his native land. He was staying with the Wampanoag tribe and was able to translate languages to the new English settlers. This was a truly life-saving meeting, as the Indians were able to show the Pilgrims how to cultivate crops in the new land. 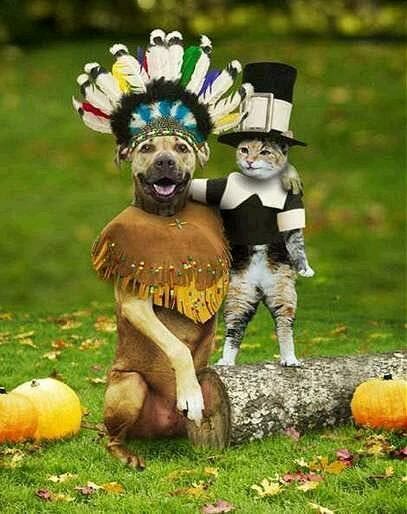 The first Thanksgiving was to celebrate a good crop in the fall of 1621, and was reportedly attended by 90 Native Americans, and 53 Pilgrims. In 1863, in the midst of the most brutal and costly conflict in American history, President Lincoln declared the last Thursday in November to be a National day of Thanksgiving and Praise. Amazingly this proclamation was made after some of the bloodiest battles in the War among the States, and the fate of the nation was still precariously undecided. Yet, this proclamation by the stalwart President Lincoln has stood the time and the tradition has continued on to today. Lincoln’s proclamation was not the first for Thanksgiving, as the early colonists had obviously declared Thanksgiving, and many of the Colonies and early States celebrated this event as well. However, President Lincoln’s proclamation made an official recognition to one of America’s most honored and treasured holidays. This formal proclamation of President Lincoln made an informal holiday of Thanksgiving until 1942, when the U.S. Congress passed a resolution making the last Thursday in November a national holiday of Thanksgiving. Thanksgiving is a time to give thanks, and recognize how wonderful it is to live in the U.S.A. However, it has become a grand entrance into the Christmas holiday shopping season by many merchants. I’m not in favor of all of the commercialism surrounding this time of year. I am very mindful of those who have gone before us, of the amazing blessings this nation has over all others, and the freedoms we enjoy because of them. My family came to America in the last 1600’s on one side, and the early 1700’s on the other. I have around 15 relatives on one side that are directly attributed to fighting for the American colonies during the War of Independence. One even helped Washington in his early surveying years. You could say I’m red, white, and blue through and through. Despite my patriotic leanings, I recognize all too well the plight of so many officers in this country. Officers who are dedicated to serving their communities, but are straddled with the fact of shrinking and limited budgets. These officers go into harms way, often with the most minimal tools available to complete their duty. Galati International – provider of inexpensive gear, holsters, and other duty items. We hope that all of our readers are able to enjoy a Happy Thanksgiving holiday, spending time with family and friends. We are grateful for those who will be on-duty during this holiday season and offer our prayers and thoughts for your safety while on duty.